Oral mucositis is a common complication of cancer chemotherapy. It begins 5-10 days after the initiation of chemotherapy and lasts 7-14 days. Chemotherapy-induced oral mucositis causes the mucosal lining of the mouth to atrophy and break down, forming ulcers. See the image below. Erythematous oral mucositis lesion on the buccal mucosa. The diagnosis of chemotherapy-induced oral mucositis is based on clinical findings and the chronology of the development of lesions. Cultures should be performed if erythema and ulcers are located on the hard palate, attached gingiva, or dorsum of the tongue. Biopsy may be indicated, but it is not routinely necessary for diagnosis. Most patients receive chemotherapy on an outpatient basis and are admitted to the hospital if they develop fever and neutropenia, obvious infection, or some other complication. Most of the data cited in this article are from studies performed on patients in an inpatient setting. Nevertheless, oral complications, when they arise in either the inpatient setting or the outpatient setting, are similar. In patients undergoing HCT, oral mucositis is reported as the most debilitating aspect of their treatment. Once present, ulcers may act as a site for local infection and a portal of entry for oral flora that in some instances, may increase the risk of developing septicemia. In addition to direct morbidity, oral mucositis contributes indirectly to increased length of hospitalization and increased cost of treatment. With the introduction of biologically targeted anticancer therapies, emerging oral toxicities have been identified in cancer patients that appear to be distinct from classic mucositis. These toxicities, for the most part, remain poorly described. The class of mammalian target of rapamycin (mTOR) inhibitors, including sirolimus (rapamycin), temsirolimus, and everolimus, are increasingly being used as anticancer agents for neuroendocrine tumors of the GI tract, lung, and pancreas and breast and renal cancers, and have been associated with the development of oral aphthous–like ulcers, referred to as mTOR inhibitor–associated stomatitis, or mIAS. They occur in 35-52.9% of patients and are characterized by discrete, ovoid ulcers with a characteristic erythematous halo, and they appear clinically identical to idiopathic aphthous stomatitis in otherwise healthy patients. Like aphthous ulcers, these are confined to the nonkeratinized tissues and have a quicker onset compared with classic mucositis. Dysgeusia and xerostomia have been reported adverse effects in these targeted therapies. They tend to have a greater impact on quality of life; however, these adverse effects may also affect the patients ability to maintain adequate nutritional intake, leading to weight loss. Oral mucositis results from a complex interaction of local tissue damage, the local oral environment, the patient's level of myelosuppression, and the patient's intrinsic genetic predisposition (eg, single nucleotide polymorphisms) to develop oral mucositis. The current working biological model for oral mucositis is based on five interrelated phases, including an initiation phase, a message-generation phase, a message-activation and up-regulation phase, a signaling and amplification phase, and an ulceration/microbiological phase, and a healing phase. In the initiation phase, cellular damage causes direct DNA breaks with the generation of reactive oxygen species, which damage lipids, DNA, and connective tissue, leading to cell death and the release of inflammatory substances. In the up-regulation/activation phase, transcription factors such as nuclear factor (NF)–κβ and distinct pathogen-associated molecular patterns such as toll-like receptor signaling emerge. During the signaling and amplification phase, positive feedback loops are activated. For example, tumor necrosis factor (TNF)–α activates NF-κβ, mitogen-activated protein kinase (MAPK), and sphingomyelinase pathways, while also contributing directly to cellular and tissue injury. The result is erythema from increased vascularity and epithelial atrophy 4-5 days after the initiation of chemotherapy. Microtrauma from day-to-day activities, such as speech, swallowing, and mastication, leads to ulceration. During the ensuing ulcerative/bacteriologic phase (during which time neutropenia is common), putative bacterial colonization of ulcerations occurs, resulting in the flow of endotoxins into mucosal tissues and the subsequent release of more interleukin (IL)–1 and TNF-α. This is likely the phase most responsible for the clinical pain and morbidity associated with oral mucositis. During the fifth and final healing phase, cell proliferation occurs with reepithelialization of ulcers. Signals from the extracellular matrix induce epithelial cells to migrate underneath the pseudomembrane (fibrin clot) of the ulcer. The epithelium then proliferates so that the thickness of the mucosa returns to normal. Reconstitution of the WBCs in neutropenic patients effects local control of bacteria, which also contributes to resolution of the ulcers. However, the direct relationship between the WBC count and oral mucositis is uncertain, and not all patients with mucositis demonstrate hematologic toxicity. The underlying malignancy and the intensity and duration of the chemotherapy regimen are the two most important factors in determining the occurrence and the severity of oral mucositis. Hematologic malignancies and highly myelotoxic regimens are typically associated with more severe oral mucositis, but many factors can modify the occurrence and the degree of oral mucositis. Other factors that modify the occurrence and the severity of oral mucositis include age, level of pretreatment oral health, oral care during treatment, and salivary flow. Young age, poor oral health before and during treatment, and hyposalivation all contribute to an increased risk and increased severity of mucositis. The use of methotrexate for graft versus host disease (GVHD) prophylaxis is an additional significant risk factor for oral mucositis, and the use of non–methotrexate-containing regimens has been shown to reduce the overall severity of mucositis. Stomatitis occurs more frequently in patients with breast cancer treated with a 5-flurouracil, doxorubicin, and cyclophosphamide regimen versus a doxorubicin and paclitaxel regimen. Nevertheless, other factors, including underlying genetic predisposition, likely also play an important role in determining risk. Generally, patients with hematologic malignancies have an increased rate of oral mucositis compared with those with solid tumors. This is, to some extent, related to the treatment regimens. Great variability exists in the stomatotoxicity of different treatment regimens. Some of the most stomatotoxic agents include the antimetabolites 5-fluorouracil, methotrexate, and cytarabine. Concomitant radiation therapy (to the head and neck region) increases the risk of oral mucositis because of synergistic effects with the chemotherapeutic agents. Younger age is associated with more severe oral mucositis. Chronic irritation from ill-fitting prostheses or faulty restorations predisposes patients to the development of oral mucositis due to local irritation and trauma. Hyposalivation prior to and during treatment is associated with an increased risk of oral mucositis. Oral mucositis occurs independently of oral mucosal infections of viral and fungal etiology, but it may be exacerbated by such concomitant infections. Better pretreatment oral health is probably associated with a reduced incidence of and less severe oral mucositis; however, this has never been proven. Regardless, maintaining good oral hygiene with daily mouth care is important. Some degree of oral mucositis occurs in approximately 40% of patients who receive cancer chemotherapy. At least 75% of patients who receive myeloablative conditioning regimens (chemotherapy with or without total body irradiation) in preparation for HCT develop oral mucositis; the incidence may be even higher in children. The incidence is also higher in patients who receive continuous infusion therapy for breast and colon cancer and in those who receive adjuvant therapy for head and neck tumors. However, in patients of the same age with similar diagnoses and treatment regimens and equivalent oral health status, the incidence of oral mucositis may vary considerably. This is most likely because of genetic differences and other factors that are not yet fully characterized or understood. No racial predilection is apparent for chemotherapy-induced oral mucositis. No sexual predilection is reported for chemotherapy-induced oral mucositis. Younger patients tend to develop oral mucositis more often than older patients being treated for the same malignancy with the same regimen. This is apparently because of the more rapid rate of basal cell turnover noted in children, although this remains poorly characterized. However, the healing of oral mucositis also appears to occur more rapidly in the younger age group. Chemotherapy-induced oral mucositis is a self-limiting condition. Oral mucositis causes pain, restricts oral intake, frequently contributes to interruption of therapy, may increase the use of antibiotics and narcotics, may increase the length of hospitalization, and may increase the overall cost of treatment. Patients with oral mucositis and neutropenia have a relative risk of septicemia more than four times that of patients with neutropenia without oral mucositis. Oral mucositis lesions have been implicated as an important portal of entry for these organisms into the systemic circulation because many of these organisms are native to the oropharyngeal region. Combination prophylaxis, including the use of penicillin and other antibiotics effective against gram-positive streptococci, has been effective in reducing the incidence of septicemia. Mulcahy N. ‘New standard of care' for oral mucositis. Medscape Medical News. October 30, 2012. [Full Text]. Mayo Clinic. Doxepin hydrochloride in treating oral mucositis pain in patients with head and neck cancer undergoing radiation therapy with or without chemotherapy. Available at http://tinyurl.com/ClinicalTrialDoxepin. Accessed: November 19, 2012. Scully C, Sonis S, Diz PD. 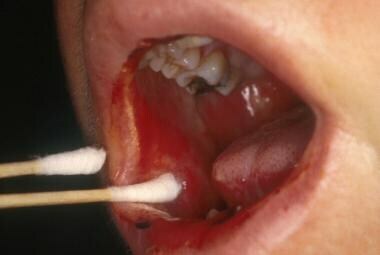 Oral mucositis. Oral Dis. 2006 May. 12(3):229-41. [Medline]. [Guideline] Lalla RV, Bowen J, Barasch A, et al. MASCC/ISOO clinical practice guidelines for the management of mucositis secondary to cancer therapy. Cancer. 2014. 120:1453-61. [Medline]. Rosen LS, Abdi E, Davis ID, et al. Palifermin reduces the incidence of oral mucositis in patients with metastatic colorectal cancer treated with fluorouracil-based chemotherapy. J Clin Oncol. 2006 Nov 20. 24(33):5194-200. [Medline]. Sonis S, Treister N, Chawla S, Demetri G, Haluska F. Preliminary characterization of oral lesions associated with inhibitors of mammalian target of rapamycin in cancer patients. Cancer. 2010 Jan 1. 116(1):210-5. [Medline]. Sonis S, Andreotta PW, Lyng G. On the pathogenesis of mTOR inhibitor-associated stomatitis (mIAS)-studies using an organotypic model of the oral mucosa. Oral Dis. 2017 Apr. 23 (3):347-352. [Medline]. Rugo HS, Seneviratne L, Beck JT, Glaspy JA, Peguero JA, Pluard TJ, et al. Prevention of everolimus-related stomatitis in women with hormone receptor-positive, HER2-negative metastatic breast cancer using dexamethasone mouthwash (SWISH): a single-arm, phase 2 trial. Lancet Oncol. 2017 May. 18 (5):654-662. [Medline]. Russi EG, Raber-Durlacher JE, Sonis ST. Local and systemic pathogenesis and consequences of regimen-induced inflammatory responses in patients with head and neck cancer receiving chemoradiation. Mediators Inflamm. 2014. 2014:518261. [Medline]. Cutler C, Li S, Kim HT, Laglenne P, Szeto KC, Hoffmeister L, et al. Mucositis after allogeneic hematopoietic stem cell transplantation: a cohort study of methotrexate- and non-methotrexate-containing graft-versus-host disease prophylaxis regimens. Biol Blood Marrow Transplant. 2005 May. 11 (5):383-8. [Medline]. Shajahan J, Pillai PS, Jayakumar KN. A Prospective Comparative Study of the Toxicity Profile of 5-Flurouracil, Adriamycin, Cyclophosphamide Regime VS Adriamycin, Paclitaxel Regime in Patients with Locally Advanced Breast Carcinoma. J Clin Diagn Res. 2015 Dec. 9 (12):FC01-6. [Medline]. Vagliano L, Feraut C, Gobetto G, Trunfio A, Errico A, Campani V, et al. Incidence and severity of oral mucositis in patients undergoing haematopoietic SCT--results of a multicentre study. Bone Marrow Transplant. 2011 May. 46 (5):727-32. [Medline]. Raber-Durlacher JE, Laheij AM, Epstein JB, Epstein M, Geerligs GM, Wolffe GN, et al. Periodontal status and bacteremia with oral viridans streptococci and coagulase negative staphylococci in allogeneic hematopoietic stem cell transplantation recipients: a prospective observational study. Support Care Cancer. 2013 Jun. 21 (6):1621-7. [Medline]. Elad S, Raber-Durlacher JE, Brennan MT, et al. Basic oral care for hematology-oncology patients and hematopoietic stem cell transplantation recipients: a position paper from the joint task force of the Multinational Association of Supportive Care in Cancer/International Society of Oral Oncology (MASCC/ISOO) and the European Society for Blood and Marrow Transplantation (EBMT). Support Care Cancer. 2015 Jan. 23 (1):223-36. [Medline]. Cutler C, Li S, Kim HT, et al. Mucositis after allogeneic hematopoietic stem cell transplantation: a cohort study of methotrexate- and non-methotrexate-containing graft-versus-host disease prophylaxis regimens. Biol Blood Marrow Transplant. 2005 May. 11(5):383-8. [Medline]. Vera-Llonch M, Oster G, Ford CM, Lu J, Sonis S. Oral mucositis and outcomes of autologous hematopoietic stem-cell transplantation following high-dose melphalan conditioning for multiple myeloma. J Support Oncol. 2007 May. 5 (5):231-5. [Medline]. Stiff PJ, Erder H, Bensinger WI, et al. Reliability and validity of a patient self-administered daily questionnaire to assess impact of oral mucositis (OM) on pain and daily functioning in patients undergoing autologous hematopoietic stem cell transplantation (HSCT). Bone Marrow Transplant. 2006 Feb. 37(4):393-401. [Medline]. Brizel DM, Murphy BA, Rosenthal DI, et al. Phase II study of palifermin and concurrent chemoradiation in head and neck squamous cell carcinoma. J Clin Oncol. 2008 May 20. 26(15):2489-96. [Medline]. Vadhan-Raj S, Trent J, Patel S, et al. Single-dose palifermin prevents severe oral mucositis during multicycle chemotherapy in patients with cancer: a randomized trial. Ann Intern Med. 2010 Sep 21. 153(6):358-67. [Medline]. Spielberger R, Stiff P, Bensinger W, et al. Palifermin for oral mucositis after intensive therapy for hematologic cancers. N Engl J Med. 2004 Dec 16. 351(25):2590-8. [Medline]. Multiple mucoceles on the hard palate. Ulcerative oral mucositis lesion on the buccal mucosa. Ulcerative oral mucositis lesion on the lateral and ventral surfaces of the tongue. Ulcerative oral mucositis lesions on the labial mucosa and the floor of the mouth. Oral pseudomembranous candidiasis on the hard palate. Herpes simplex virus ulceration on the dorsal surface of the tongue. Herpes simplex virus ulceration on the hard and soft palate. Note lesions on the right upper lip and the dorsum of the tongue. Acute graft versus host disease involving the dorsal surface of the tongue. This is a keratinized site that is usually not involved by oral mucositis. Disclosure: Consultant, however no monies have been recieved as of yet. for: OraPharma.